Defining the overall ecological status of lakes according to the Water Framework Directive (WFD) is to be partially based on the species composition of the aquatic macrophyte community. We tested three assessment methods to define the ecological status of the macrophyte community in response to a eutrophication pressure as reflected by total phosphorus concentrations in lake water. 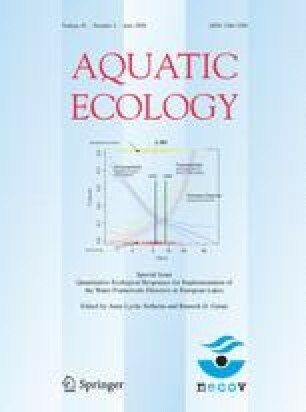 An absolute species richness, a trophic index (TI) and a lake trophic ranking (LTR) method were tested at Europe-wide, regional and national scales as well as by alkalinity category, using data from 1,147 lakes from 12 European states. Total phosphorus data were used to represent the trophic status of individual samples and were plotted against the calculated TI and LTR values. Additionally, the LTR method was tested in some individual lakes with a relatively long time series of monitoring data. The TI correlated well with total P in the Northern European lake types, whereas the relationship in the Central European lake types was less clear. The relationship between total P and light extinction is often very good in the Northern European lake types compared to the Central European lake types. This can be one of the reasons for a better agreement between the indices and eutrophication pressure in the Northern European lake types. The response of individual lakes to changes in the abiotic environment was sometimes represented incorrectly by the indices used, which is a cause of concern for the use of single indices in status assessments in practice. REBECCA was funded by the European Commission under the 6th Framework Program, Contract No. : SSP1-CT-2003-502158—REBECCA. The authors thank all intercalibration representatives who contributed to the realization of the database and the formulation of ideas and concepts during discussions in REBECCA and GIG meetings: Laszlo Toth (JRC), Deirdre Tierney (IE). We are grateful to data suppliers for their willingness to supply data for the REBECCA dataset of European macrophyte data: Heikki Toivonen (SYKE, Finland), Tapio Rintanen (Finland), Helle Mäemets (Centre for Limnology, Estonia), Luc DeNeijs (Institute of Nature Conservation, Belgium), Vaida Olsauskyte (Lithuanian Environmental Protection Agency, Lithuania), Hanna Soszka (Institute of Environmental Protection, Poland), Arie Naber (Institute for Inland Water Management and Waste Water Treatment, the Netherlands), Gary Free (EPA, Ireland). Gary Free (EPA, Ireland) and Eddy Lammens (Institute for Inland Water Management and Waste Water Treatment, the Netherlands) provided valuable comments to earlier versions of this manuscript.